Our 10th Medium-Term Strategy has five pillars that influence all areas of the Institute’s work and serve as guiding principles in implementing our mission. The five thematic areas are social inequalities, learning outcomes, education system resilience, governance and accountability, and education financing. Discover all five priorities in our strategy! 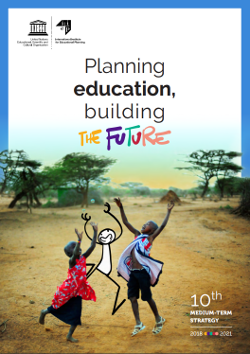 Meeting the Education 2030 agenda requires proper attention to financing in educational planning and management. Governments need to mobilize resources and make hard choices. Financial flows through the system – and, ultimately, expenditures - need to be monitored to determine the extent to which resources are being allocated to policy priorities, and with what effect. With growing pressure on governments to increase funding, improved financing data has become a higher priority, allowing governments to identify who is investing in education, and to calculate actual costs, and assess the effectiveness and efficiency of resource allocation. the World Bank. IIEP will continue this work, and studies on sub-sector accounts are also anticipated. 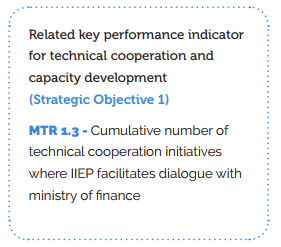 Beyond country-level engagement, IIEP will remain an active participant in discussions on financing mechanisms at the global level and will thus be ready to assist Member States to access appropriate resources. IIEP will consolidate and update existing lines of work (in sector analysis, simulation models, medium-term expenditure frameworks, etc.). It will also address what is currently a ‘blind spot’ in education financing: the area between public finance – which has its own techniques, professionals, and networks – and financing for education sector specialists, whose diagnoses and planning contributions too often fail to influence mainstream budgetary processes. Support countries in conducting NEAs and sub-sector education accounts. Facilitate policy dialogue with ministries of education and ministries of finance. Conduct analysis and training on cost-effectiveness models for ECD. Develop a new training offer on public finance and innovative financing models.